In 2014 the British Royal Mint issued a gold proof 50p coin only 8 mm in diameter*, weighing in at 1/40 Troy ounce (0.8 grams.) This is the smallest coin the UK has ever struck and surely one of the smallest modern coins. For comparison, the smallest coin the US Mint has ever produced–the US gold dollar, struck in several designs from 1849 to 1889–weighed 1.672 grams and measured 12.7 to 14.3 mm. There are three ways a coin can be tiny: weight, dimension (diameter and thickness), and value. The Latin motto of the American Numismatic Society is Parva Ne Pereant: ”let not the small things perish.” The survival of so many extremely small coins from the remote past shows how appropriate this slogan is for people who treasure ancient coins. Let’s start with the silver drachma of the Athenian or “Attic” standard, weighing 4.3 grams. For comparison, a fresh uncirculated American nickel weighs exactly 5.000 grams. The drachma was divided into six obols, each about 0.72 gram. The little obol, in turn, was subdivided into halves (hemiobol), quarters (tetartemorion) and even eighths (hemitetartemorion.) Measuring only 4-5 mm in diameter and weighing 0.08 to 0.12 grams, the little hemitetartemorion was the smallest Greek silver coin. It is hard to imagine what such a small bit of metal (only 1/48 of a days wage for a laborer) would buy – perhaps a chunk of bread or a cup of cheap wine. Like most questions in classical numismatics, the dating of these coins is controversial, but circa 650 BCE is the earliest guess for unmarked types and ca. 630-620 for types stamped with designs. The weight standard was based on a stater of about 14 grams, worth three month’s salary for a mercenary. Because electrum was so highly valued, most of the coins were smaller; thirds, sixths, twelfths, and twenty-fourths. The 1/24 stater, weighing about 0.57 grams and measuring only about 6 mm in diameter, could purchase a sheep or a bushel of grain (Linzalone). But the need for even smaller units in the day-to-day transactions of city life led to the production of miniscule 1/48 and 1/96 staters. 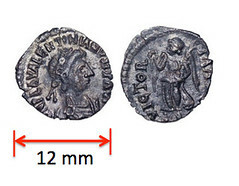 At 3 or 4 mm in size, weighing just 0.15 to 0.10 grams, these are the smallest coins issued in the ancient world. I find it easier to avoid the decimals and just think of the weight as 150 to 100 milligrams. To keep this in perspective, an aspirin tablet weighs 325 milligrams. In the local coinage of first century Judea, the smallest denomination was a bronze coin called a lepton in Greek and a half prutah in Hebrew. The smallest denomination coin known to the translators of the King James Version of the Bible (begun 1604, published 1611) was the Flemish mijt or “mite,” a debased silver piece of about 0.7 gram, worth half a farthing or 1/8 of a penny. It never circulated in England, but the word was familiar enough to contemporary readers that “mite” was used to translate lepton. The upside of this is that when they do appear on the market, they can be quite affordable. 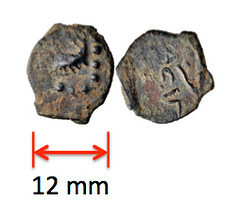 Well-worn, poorly struck examples of the bronze “Widow’s Mite,” commonly found in large numbers in the Holy Land, can often be purchase for under $20.